Sometimes you get involved in something and it can be hard to pull yourself out of it. Now I, too, like dozens of other craftsmen, have been sucked into this “live edge” furniture craze. Just two weeks ago, as I was leaving church, someone came up and handed me a program, on the back of which was sketched out a rough plan for an entertainment cabinet with bookcases. Next to the drawing was scrawled the words, “Love Live Edges”, and unknown to the person who gave me the sketch, I had just started making my first live edge coffee table to go in a home in El Paso which is 600 miles away, so I don’t think it is something in the drinking water. Must be that wave of Urban Naturalism sweeping over our cities. For more on urban naturalism, you can checkout “Toward An Urban Naturalism” by Christopher Smith. While vacationing on the West Coast, the couple I am making this coffee table for stumbled upon an Urban Hardwoods showroom in San Francisco. 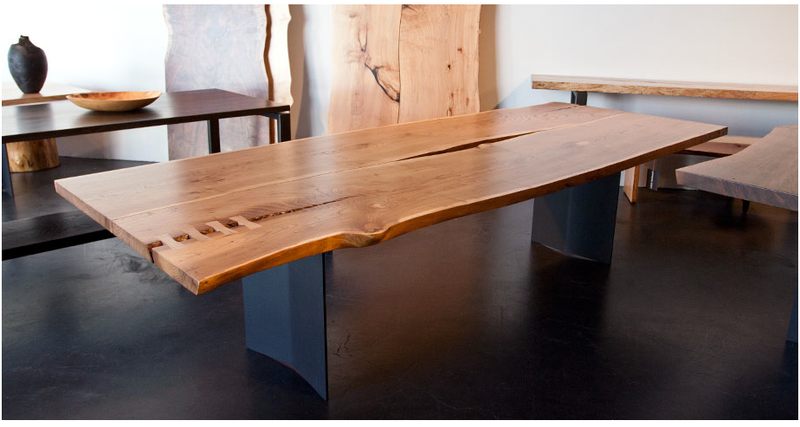 Urban Hardwoods specializes in making live edge tables using slabs milled from trees that have been taken down in urban areas and often rescued from going into landfills. They must be doing a good business since they have locations in three major cities. 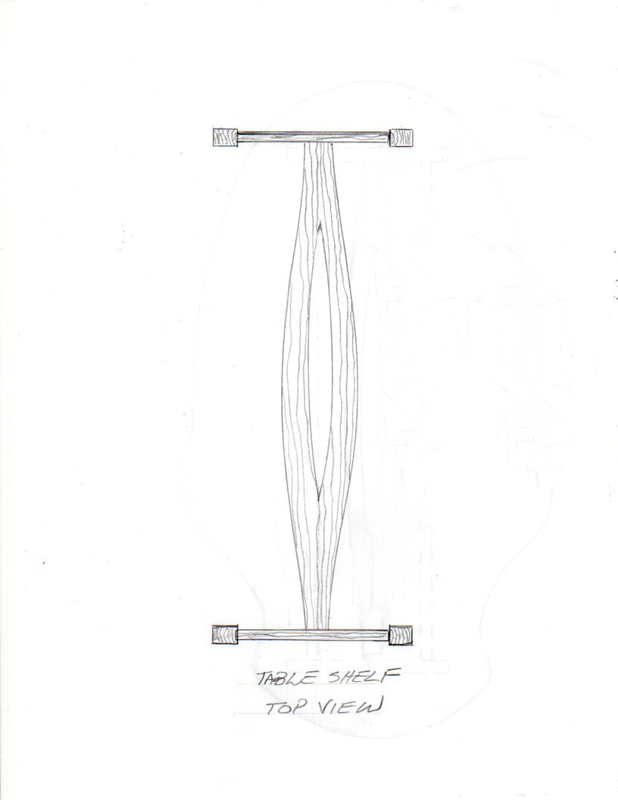 “Yes, certainly”, I replied, but after visiting the Urban Hardwoods website I knew I wanted to design a table that had much more than a pre-made metal base or pedestals of plain wood slabs; and this is my critique of so many live edge tables. They have beautiful tops with unimaginative or prefab bases. Some will say that it is about the beauty of the wood and the base should not compete with the top, but I don’t believe that fine design ever competes with nice materials; it only enhances them. Anyway, I did find some lovely material, a pair of book-matched mesquite slabs that I knew would make a striking top with live edges. Next thing was to design an interesting and appropriate base to go with these slabs. I wanted something that was sculptural and organic with some light coming through it. Here is what I arrived at. The following photos show the coffee table as it was being built. Here are a couple of views of the completed table waiting for the finish to be applied. Coming very soon are photos of the finished table. To see more of my work, please visit my Furniture Gallery. Very nice piece! Are you using loss tenons in the legs? Thank you for commenting Pierre. 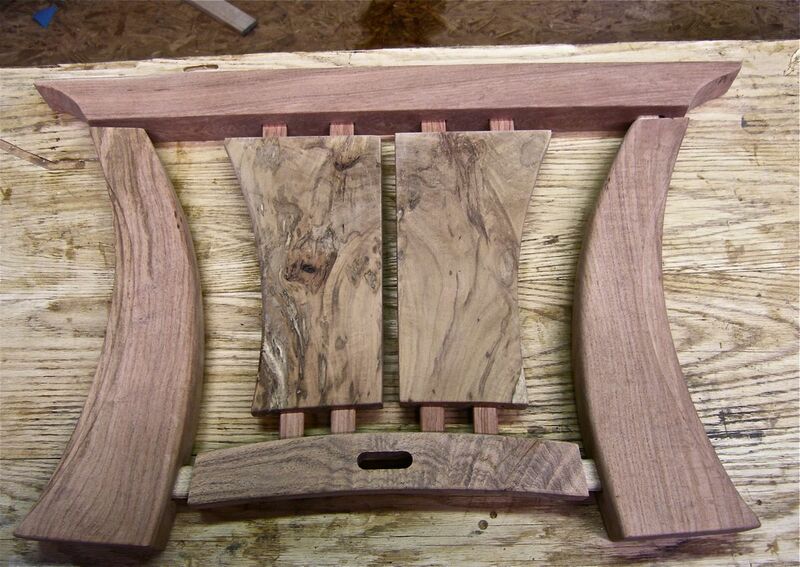 Yes, exactly, those are loose tenons you see on the legs. I’m a woodworker student in Rotterdam, the Netherlands. My English teacher gave me and the all the other 3rd year students the assignment to react to your blog, so you will have a lot of comments in the end of the week. I really like the design of your coffee table, it is one of the most beautiful tables i have ever seen, and i have seen a lot of tables! but i do not agree with your wooden frame idea. I think that the living edge wood is so beautiful that it deserves all of the attention. And if you have such a busy frame the living edge wood doesn’t get all of the attention. but you made a beautiful piece of art. Thank you very much for your comment. I wish you and your fellow woodworking students the very best in your studies. There is a debate that goes on among furniture makers about what kind of base to use with a beautiful live edge top. Some agree with you. They like a simple base that does not compete with the beauty of the natural edge top. I have a different view on this subject. I want to express myself as a designer and a skilled maker in every piece of furniture that I create. When I see a live edge table with a simple base I think, “This looks too easy. This table is not an expression of good design or skilled craftsmanship. 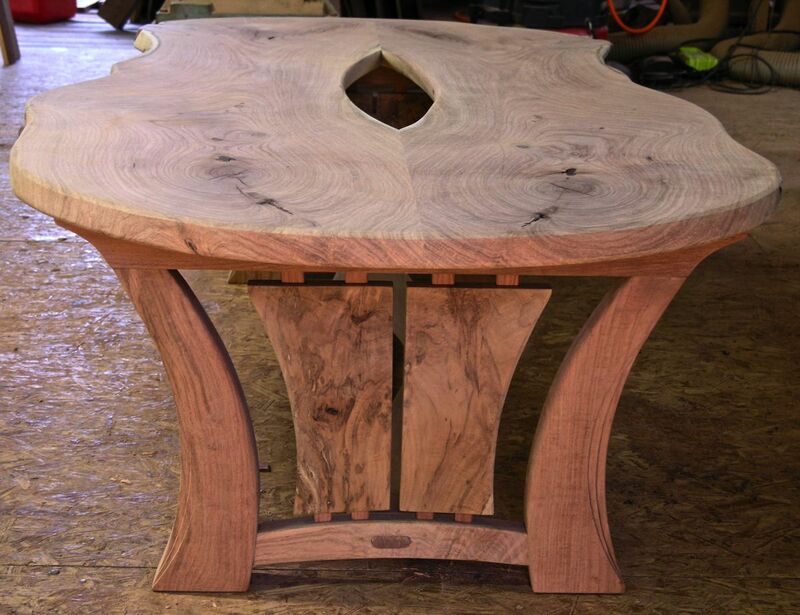 Anyone could make a table like this.” When I find a beautiful live edge slab I think, “This lovely wood deserves a very special base of original design to go along with it.” I try to show respect to the beautiful top by creating a beautiful base to go with it. I just can not seem to help myself. I have three or four new live edge tables I have recently made that I will soon post to my blog. Perhaps you can give me your opinion about them after you see them. As your own skills as a designer and maker begin to grow, you may find that your opinion about what you like also changes. When you learn new and more complex techniques as a woodworker, you will want to find ways to apply these techniques to your furniture. Your furniture designs will become more sophisticated. I hope we can continue to discuss these ideas more in the future. All the best to you, Jasmign! I do not agree or disagree with you. I like both options. Like Jasmijn told you she likes it when the top stands out and the frame just be there to hold it up and that’s it. I can see the beauty in that. 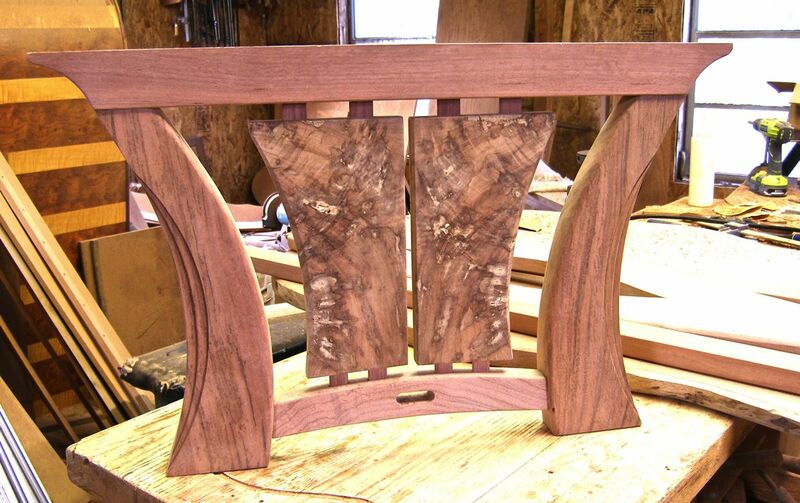 But indeed if you are making an piece of furniture (art) why not make everything beautiful. so like I said I do not really have an opinion about this. Thank you for your comments & I am very glad you like my table. I agree with you. 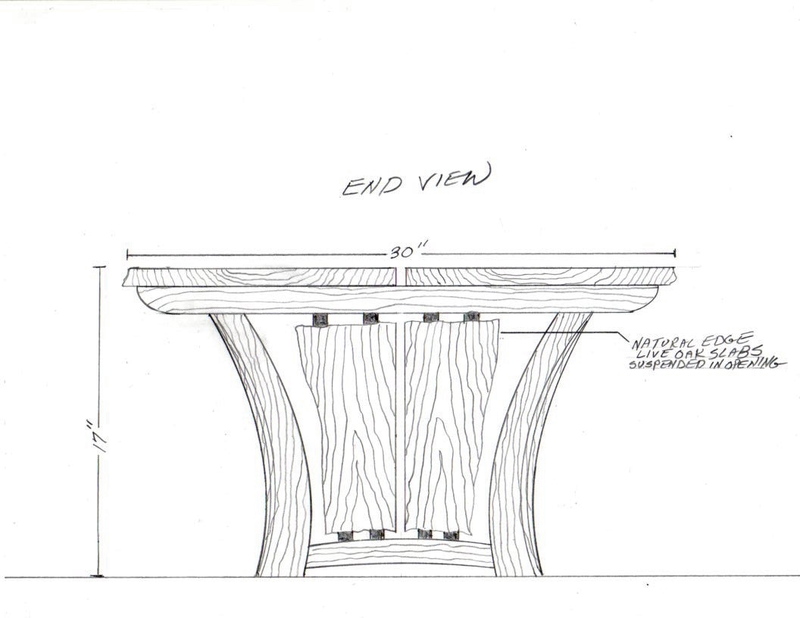 I think both options for a live edge table base are good. Our disagreements should be friendly disagreements. If we all agreed on the same kind of designs, the world would be a very boring place. Tonight I will try to post some photos on my blog of new live edge tables I have recently made. I’m an other student at HMC from the Netherlands. I am not a big writer and certainly not in a different language. But I will give it a try. Most work I have done were for kitchens and interiors. Many of them are with special connections and high tech equipment. I saw that you connected the table shelf to the side panel with a mortise and tenon. I haven’t seen such mortise and tenon before. My question was why did you made that slices? I don’t think that the right word, but I hope you understand my question. I really love your design, a little back to nature. Thank you for you comment and question, Phyllis. The wood joint you are asking about is called a “through tenon” because the tenon goes all the way through the panel. 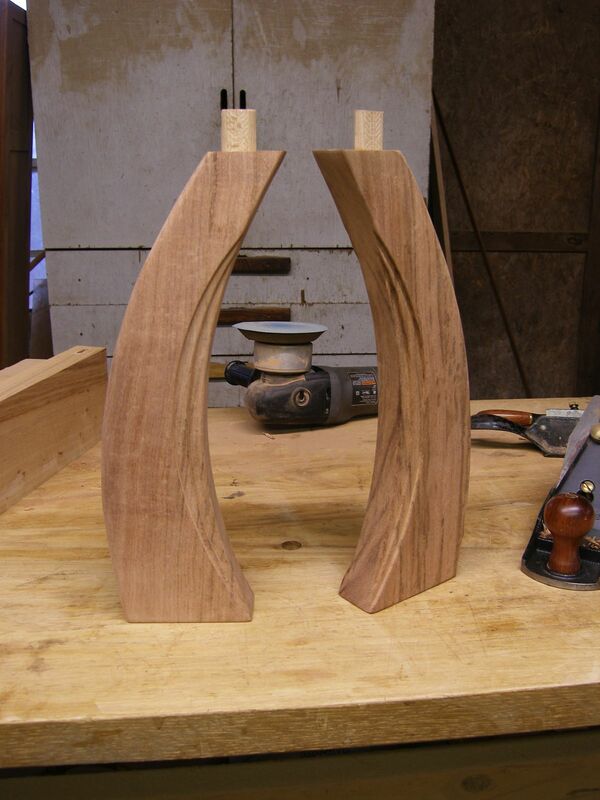 Tapered wedges are driven into the cuts or slices in the tenon to spread the tenon and make it fit even tighter. It is a very strong joint and because you can see the tenon, it becomes a part of the design of the table. All the best to you! Like you have already figured out most the comments are from us Dutchie’s who have to reply on your blog. Well here’s another one, my name is Mathijs and im also from HMC from the Netherlands. I enjoyed scrolling through this page and watch the picture’s of the table, it realy looks amazing but i can imagine it was a hard project to work on. Anyways keep up the good work! Thank you, Mathijs, for your comment. I hope you are enjoying your woodworking education at your school. Yes, the table was a challenging piece to build. I frequently try to push myself and learn new techniques with each new project. No matter how long you make furniture, there is always something more to learn! I just published some new photos of live edge tables in my latest blog post. I hope you and your fellow students will take time to look at them. Thanks! I loved what you did whit the table leaf. By mirroring the to parts of the table leaf the effect is amazing! The drawing from the wood comes to his right. In all te parts of the table. The spot in de middle is cool, looks organic and gives a really nice touch to the hool object. Something mysterious. Nice table! good to see that de great craftsmanship comes forward in to it. I loved what you did whit the table leaf. By mirroring the to parts of the table leaf the effect is amazing! The drawing from the wood comes to his right. In all the parts of the table. The spot in de middle is cool, looks organic and gives a really nice touch to the hole object. Something mysterious. Nice table! good to see that de great craftsmanship comes forward in to it. It has another table with a mirror top. I hope you will enjoy this new table also. I have some pictures of your furniture views I can only say one thing about how awesome you made that pretty and that with the hand. By nowadays getting so much done with computerized machines. I wish you good luck with your career. Hello my friend, Luutgard. Thank you for taking the time to comment on my furniture. I wish the very best for you and your future as a furniture maker. Luutgard, thank you very much for your comments. Keep working hard in your studies and you will very soon be making some great furniture! I know the computerized machines are good for making parts quickly but I have no interest in getting one. I advertise to my customers that I make my furniture by hand. Best regards! Of course i’m also a student of the HMC, so i did read your blog. It’s nice to see how you this piece of furniture described! I mainly follow no blogs, but after this i think i will change my mind! This beautiful wood takes is so nice, i’m also going to make such like this! I wish you all best with your woodworking and thanks for enthusiastic me! Thank you for taking the time to comment on my blog. I hope you are enjoying your studies. I am a student from the HM College in Rotterdam, as you already know we must comment on youre blog as an assignment for English. I love what you did with the table that you have maked, I really like the style and the woodwork. I normally don’t read that many blogs but this kind of blogs is really fun and educational to read. Thankyou for your blog and keep them posting! Thank you for your comment, Rens. I am very glad you like my table. I hope you are enjoying your studies and I wish you the very best! I think you did a good job making this table. It is very beautiful! And it looks like you did it al with oldfashioned tools. that is so lovely! I also think your drawings are perfect and your table also. I hope I can make this kind of furniture one day! I hope you gonna make a lot more of this kind of furniture! Dear Pauline, thank you for your wonderful comments. Keep working hard, always try to learn new things, and you will be making beautiful furniture very soon. I am sure of it. I am kai van eck and i’m also a student of the HMC in Rotterdam. I have also read your blog for my English assignment. I think that you made a beautiful table I like the way you make your furniture you really inspire me to make my furniture the way you do! That coffee table you made is so amazing I want to make one of them for myself (ofcourse with my own twist). The big tree slabs you use are so stunning I really like the idea. I wonder what type of wood do you mainly use? I am very happy that you like my furniture and I believe that you will soon be making great furniture yourself if you work hard in your studies. I enjoy using many different kinds of woods. The woods I used in my table came from trees that grow in the region where I live (mesquite wood and pecan wood), but I also like to use woods that come from foreign countries and different areas of the world.Do you have some favorite woods? What you would now is that I’m also an student from the HMC in the Netherlands. I also need to comment on your blog. So I’ve readed it and i like your sense of taste. I have seen lot of tables but never a table like yours. I think that it was a difficult table to make. And I like your creactivity. So keep up the good work. You did a nice job! Jimmy, thank you for your nice comments. I enjoy designing furniture that is challenging to make. This way I am always learning new things! My name is Rick Zagwijn I’m also a Student of the HMC. I`m learning to be a furniture maker just like the others. I read your blog and I like the style of furniture u make! I think it’s beautiful to keep the wood in his normal shape. I really like the final result and I hope you can make many more! Rick, thank you for your comment. I would love to see some of the furniture that you make. I wish you great success! My name is Mees Schepers, I am a student of the HMC also. Your blog was really intresting, but also that you make your furniture from homely wood. The pictures are really nice to see. I also like the shape of the table and the wood colour a lot. Thank you for your comments on my blog. I wish you the very best in your studies! I am following the study of furniture maker / craft. Our teacher gave us the task to read your blog and to give our thoughts about it. 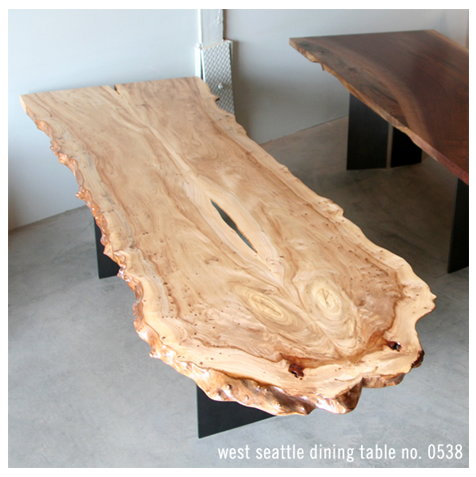 I especially like the table at the first picture: ‘west Seattle dinning table’. It looks amazing, I like the raw look that it has. The table with te mirrored pieces of wood looks very cool, just like Sabastiaan said: ‘The drawings of the wood comes to his right. In my opinion is the table perfect. I am happy you like the tables. Thank you very much for your comment. I’m pretty sure this won’t come as a surprise, but I am (same as many others) a student at the HMC in Rotterdam, which means I study furniture making aswell! The design of this table looks amazing, I’ve seen a lot of these kind of tables and I always wanted to make one myself, just because I like the use of the ”raw” material (in this case the living edge table tops!). You have definitely inspired me and now I might do some research to make one myself. Hi Jos, very happy you like my table & find it inspirational. Keep studying, working hard, and you will soon be making great furniture! Nice table you’ve built, I love the use of semi-raw materials combined with either simple bases or complicated wooden bases. I also really like your enthusiasm in your writing and your work. I hope you keep on innovating and building these very nice tables. Thank you, Martijn, for your comments & encouragement. I wish you all the best! My name is Sanne van Genderen, I am a girl from the Netherlands. And I think you allready know what I am going to say, I am also a student from the HMC. I am studying for furniture maker/ designer. My opinion about your table design is, you’ve got a different kind of thinking of making furniture, I like that. It’s a different style and not alot of people here in the Netherlands have that kind of tables. But I like this design more than the standard designs. I hope you will make more of these beautiful tables/blogs. Dear Sanne, thank you for your lovely comments. I encourage you to also be creative and produce your own furniture designs. I wish you great success in your studies! I am also a student from the HMC at Rotterdam. I realy liked your blog, I also want to make tables in the future. So i loved the pictures, the first one I liked the most because you really see the structure in the wood. Thank you very much, Robbert. I hope you are enjoying your studies and wish you all the best in your furniture making endeavors! I did read your blog and enjoyed it, especially the progress pics of the table, awesome how you did it. Between all the comments I saw a classmate promote his Instagram account, and you replied him with your account, so I looked it up on Instagram and was scrolling through your timeline and did liked some pics and started to follow you. Hopefully you will make more furniture like this table because it is an beautiful table. For now goodbye and the best wishes for you! Hi Doreen. Thank you for reading my blog and commenting. I also found your Instagram page & started following you. Glad to see you like weightlifting and stay fit. I do too! All the best to you. My name is Inez and I’m (also) a student from the Netherlands. I’m learning to be a designer as well and I thought your blog was very inspiring for young designers. I really like the ‘live edge furniture’-style you have. I really like your work and especially the ones with mesquite stamps and oak roots. I love the way you bring nature into homes through unique furniture pieces. Keep up the good work and I hope to see more work of you in the future! Dear Inez, I am happy you like my blog and table. I hope you are enjoying your studies in woodworking. Thank you for commenting. I enjoyed your post very much as I completly agree on your view on how most live edge tables are currently being made. Unlike most, you gave it a unique character and making one “whole” table with your base design. Astoundingly good work, well done. Thank you Max for your comments and kind words. I appreciate it! I hope your studies are going well and you are enjoying your school. All the best, my friend! I totally agree with you on the matter with the metal legs. Metal legs may compliment the live edge, but I will always choose wood over metal. my only negative points, about the table, are the wooden upright slabs inbetween the legs. I would have rather seen the legs without them. I think they overcrowded your design. But besides that You did a wonderfull job. You have chosen beautiful materials and I especially like the joinery. 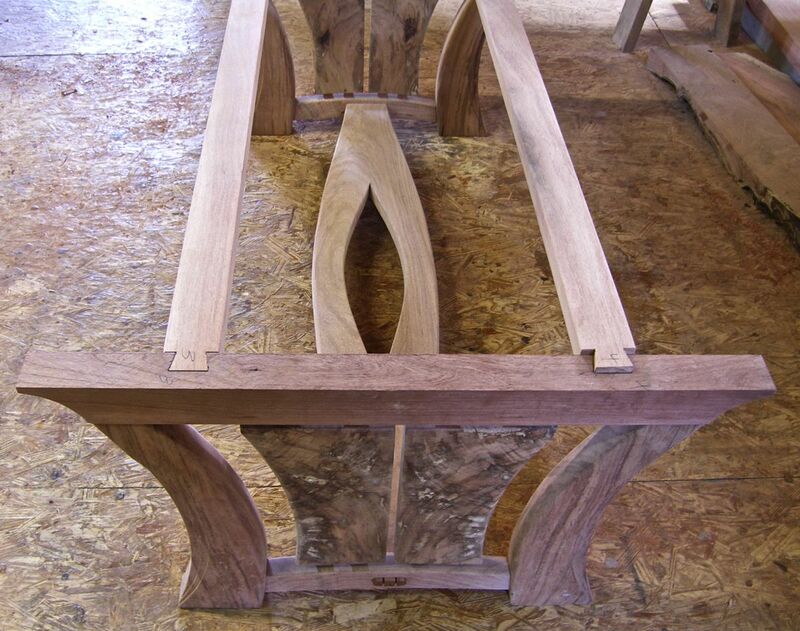 I love the use of dovetails and your mortise and tenon with the wedges looks great to! I really liked it to read your blog. It was very entertaining. I think the way how you deal with the material and the design of it is very impressive. You let me think about it a lot, and it gave me a lot of new ideas. Thanks for that. Keep on writing, because I really like to read more of these texts. First of all, I love your design. It feels like this table could bring nature back in the room where it stands. Even though I’m a big fan of using other materials when it comes to designing a piece of furniture, you show that it can be astonishing without any other material than wood. This table shows a lot of craftsmanship and care, something you can’t buy in any store these days. I’m a student at HMC from the Netherlands. This study is about making furniture. My English isn’t so good. I like the furniture that you make. How you mirror the wood it is very nice. I like that you make furniture from wood and I see the beauty from wood at your furniture. You make a lot of beautiful stuff. The live edges around the top are really nice. I totally agree with you on the matter with the metal legs. Metal legs may compliment the live edge, but I will always choose wood over metal. my only negative points, about the table, are the wooden upright slabs in between the legs. I would have rather seen the legs without them. I think they overcrowded your design. But besides that You did a wonderfully job. You have chosen beautiful materials and I especially love the joinery. 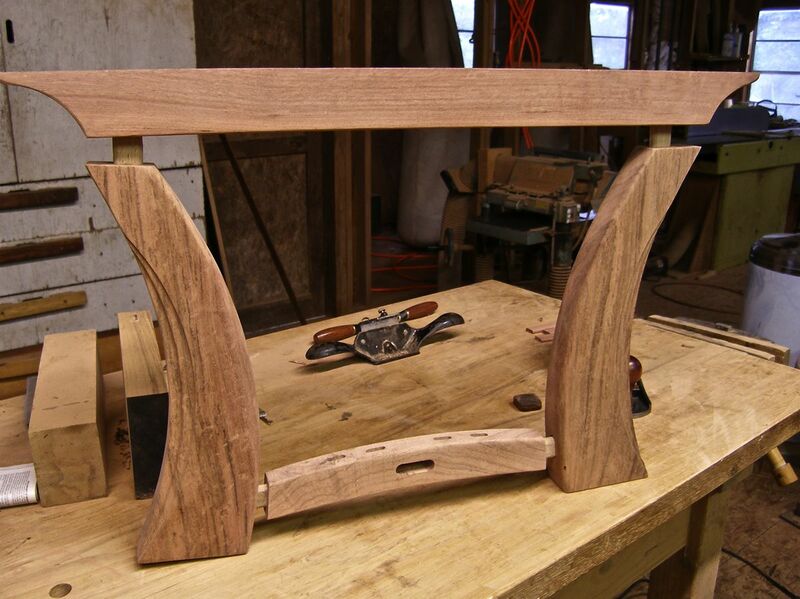 I love the use of dovetails and your mortise and tenon with wedges looks great too! Hello Koen, thank you for commenting & sharing your thoughts. I think it is great that you like a simpler base. it would be a boring world if we all agreed on the same things. All the best to you & God bless! I am a student of the HMC in Rotterdam. I really like your table design, the use of natural wood it really beautiful. It’s a real craftsmanship ! I hope I can make tables like that someday. Thank you for your comments, Rosanne. I hope you will continue to work hard & become a great furniture maker! I will continue to work hard, too! All the best. My name is Bas Moree and I’m also a student at the HMC. I am also learning to become a furnituremaker. 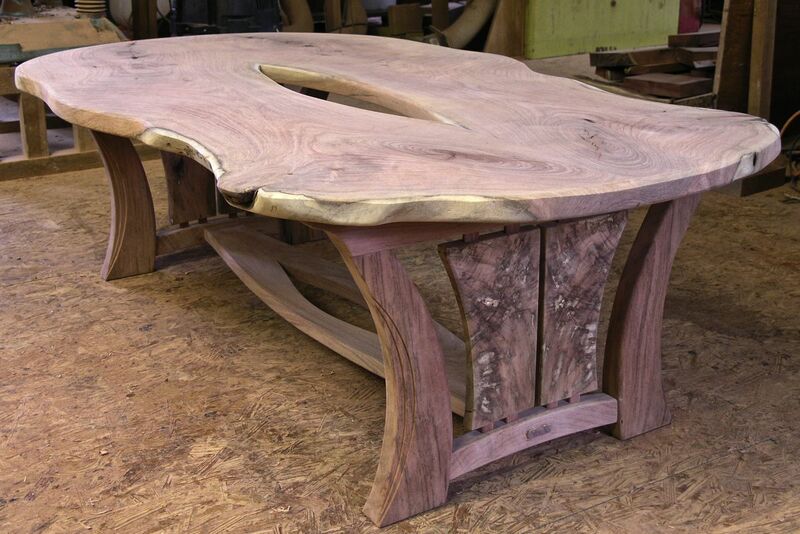 I really like your style of the coffee table you have made, I really like these kind of table tops that you are using. This way you can see the real shape and naturel look of the wood. I really like the end result of the coffe table. I love your work. Keep on doing what your doing! Bas, thank you, my friend, for your nice comments.I am happy you like my table. I wish you great success as a furniture maker! What a beautiful table you made. I like the live edge style a lot, instead of painting a beautiful solid piece of wood into some ugly color is such a waste that is why I love that style. You create something that has nothing to do with nature and still it holds that beautiful nature look. I also once tried something like this at one of my interships at school (yes I am also one of the students at the HMC) it was a very difficult project but luckily it was just a practice. It came out rather fine but I what I did figured out was that you need really good tools to do such a task. Please continue your beautiful and fine work it is absolutely inspiring. Dear Steffie, I want to thank you for your comments. I hope you will continue to explore new designs and develop your skills as a furniture maker. I would love to see some of your work. All the best! My name is Anna van Noppen and I am eighteen years old. I live in the Netherlands and I ‘am a student at HMC Rotterdam. For an English assignment we have to comment on your blog. First of all, I love your designs! The use of natural wood is absolutely beautiful. I would like to become a furniture maker someday and your definitely my inspiration. It’s a real craftsmanship ! I hope I can be as good as you someday. Thank you for your inspiring blog and keep on the good work! We were reading your comment and we are interrested what you are going to do in friesland??? Hi Anna, thank you for your comment. So glad you like my designs. I hope you will continue your furniture making training & create your own beautiful furniture. Your English is excellent! I have a daughter named Anna. All the best to you! My name is Mariëlle Dijkman and I am also a student of the HMC. I really like your desin of the the table and the use of natural wood. I enjoyed scrolling through this page and watch the picture’s of the table. It’s amazing!! Hello Marielle, Thank you for scrolling through my blog and taking the time to comment. I hope you are enjoying your studies. Keep working hard! I loved what you did with the table called leaf. By mirroring the parts, you have made an awesome effect! you made the wood stole the show, In all the parts of the table. The spot in de middle is cool , it looks organic and gives this table a personality. It’s just a very, very cool table! Hi Rick, thank you for noticing so many details about my table. You are a good observer! Thank you for your comments. An other student from the HMC over here! Wow you’ve showed some good creative work over there! Your coffee table looks very fine and I like the design of it. Still I like drinking coffee more, especially in the early morning 😉 I hope you understand…. You should keep doing what you do ’cause it looks great! Hello my friend, Jochem. Thank you for commenting on my table. I understand about the importance of coffee. I enjoy good coffee and have some every morning. I will keep working hard at making my furniture. I hope you will do the same. Another student from Rotterdam here. I was really impressed by your coffee table. It look very rustic and rough, but it still has a modern touch. I think that the use of a wooden base gives it that rustic and rough touch. The live edges make it more modern since, as you said, it is seen quite a lot nowadays. I also looked at your other custom handmade pieces and fell in love with the pecan rocking chair. I’m a big lover of country music and everything “country” related. That chair to me, screams country. Love it. Hi Samira. Thank you for your interesting comments about my work. I thought your comment about my chair and country music was especially interesting. I live in Texas where many of us enjoy country music. If you ever visit, I will take you to a country dance hall. I am sure you would really like it. All the best! I love the way you use recognisable materials as a piece of wood with the bark still on it. The two tables are quite amazing to look at. I also like the way you are designing the table’s foot. Your craftsmanship is high levelled if you ask me. The way you describe these projects from beginning to the end is very useful. I like your blog and I hope you will continue writing those blogs. Well, I think I will go read another one now. My name is Manon Christ and I’m also a student at the HMC form the Netherlands. I really likes your design! I love what you did with the table that you have made, I really like the style and the woodwork. I’m a woodworker student in Rotterdam, the Netherlands. My English teacher gave me the assignment to react to your blog. I loved what you did with the table called leaf. I really like the desigdn of your table, I never saw it before. I enjoyed watch the beuatiful pictures and I would love to make this by my one. my name is Roel and live in the Netherlands, I’m a student at the HMC Rotterdam. First of all, I like your style a lot, it’s a bit organic and i love that. I think it’s a great idea to use robust wood with fine modern metal. I hoop you keep doing what you do because it’s some great work. Wow! Beautifull table! I love it, I love the organic look it has! I agree on your opinion about the pre fabricated, unimaginative bases. I don’t like those either. Your’s really match the top and makes it into a complete masterpiece! your coffee table is amazing. such a cool table. that you made a table with a wooden base is so cool. thanks for the info, and keep up the good work! Hello Lucas, Thanks very much for your comment. I am happy you like my table. I hope it will inspire you to do your own great work. Keep working hard! Best regards. It may not surprise you that I am also a student from Rotterdam. And that our teacher gave us the assignment to comment on your blog. To be honest, I don’t really like the design. It is not really my style. However I can appreciate your craftsmenship. I like the book matched tap. Dear Max, thank you for commenting on my table and I appreciate your honesty. I completely understand that the design is not your style. You should be true to yourself and express what you like in your designs. It would be a very boring world if we all liked exactly the same things. I love looking at the work of other people. I feel like it teaches me new things even when something is not my style. Best regards! I’m Delano and I’m also a student from HMC. I really like the design of the coffee table. The pictures on this page are beautiful. you inspired me. Hello Delano (your name rhymes with “hello”). Thank you for your comment. I am happy I could inspire you. I hope you will work hard and create beautiful furniture of your own! I’m max and i’m a student of a nice woodcrafting school in Rotterdam. I do like your work and craftmanship, it’s rough and looks super natural. 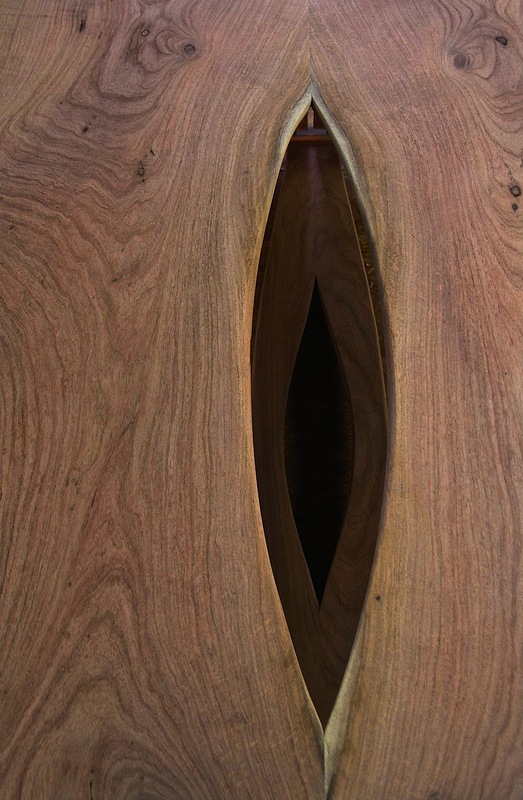 the natural curves of wood are always inspiring to look at. that’s why i’m always stoked to see more of this work. 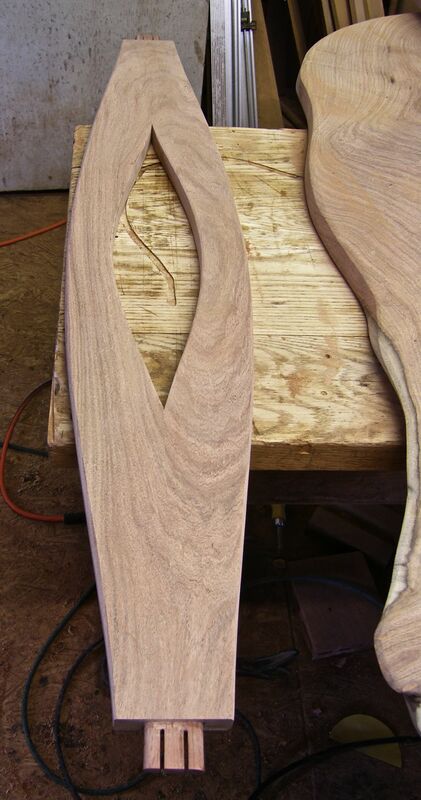 keep on going and hope to see more of your impressive way of crafting wood and following the curves. Dear Max, I am so glad you like my work. I hope you will be inspired to create your own beautiful designs! Thank you for taking the time to share your thoughts. Stay stoked! My name is Eli van den Hoogenband and I study at HMC. I read your Blog and I like the tables, I like the style of Wood. Maybe you have more pictures of the work you do. I hope you will write more blogs. I am also a student from the wood and furniture school in Rotterdam. I read your blog and viewed your photo´s. What appealed to me was the dovetail joint in the line of the table. I too am seeing more and more live edges and the use of slabs in furniture these days. I had a project once where we made a coffee table using the material of just one slab. We created the table top from half the slab and the legs of the other half. We made a rough and quick table. But seeing your creation and the idea of making a balanced base, I’m beginning to get a bit jealous of the great design. The base looks very nice and doesn’t take all the attention from the viewer. Thanks for the great post and the inspiration. Hello Mark. Thank you for your comments. I hope you will continue working with live edge slabs and also try other styles of furniture. I have to do a lot of drawings to come up with my designs. I think drawing is very important to becoming a good designer. All the best to you. I like that you have been inspired by a furniture store and I agree on your opinion about the tables with basic chassis. And after seeing your table, which is incredible with the round shapes and connections, I agree even more. I found your table amazing, it is exclusive and i love that. And it’s very nice that you mirror the slab. I have learned mirror with veneer by feadship. Feadship is the place I did my internship. If you’d like a can send you pictures of it.. I wish you great success in your studies. I am, just like other people below, a student at the HMC in Rotterdam, The Netherlands. The pictures of many tables of yours, let met think of a practical assignment at school. We had to make a casket, kind of cigar box, and we had to veneer the lid and bottom. The one half the same as the other, as if there is a mirror between them, just like your tabletops. I enjoyed reading your blog, but especially seeing your pictures. Hi Arie. Thank you for your comments. I hope you will continue to develop your furniture making skills by working both with veneers and with solid wood. All the best! My name is Jouri and I live in the Netherlands. I am studying to become a wood and furniture maker at the HMC in Rotterdam. I really like the coffee table and all your other work in your portfolio. In the furniture business you are sometimes limited by the finances of the client and then you need to use an iron frame. Also, there are times when you have to think about the weight of the table. However, when you are free to build a table in the way you want, then it is beautiful to build a table completely out of wood. Hello Jouri. Thank you for your comments about my furniture. You are right, sometimes the finances of the client are limited and you cannot be as creative as you would like. In that case, keep your design simple and do the best work you can. A simple piece done well is still a pleasure to see. Keep working hard! My name is Quinten van Dommelen and I’m also a student at the HMC in Rotterdam. I enjoyed reading your blog (even though I had to for school :P). I really the design of your coffee table, especially the natural edge sides. 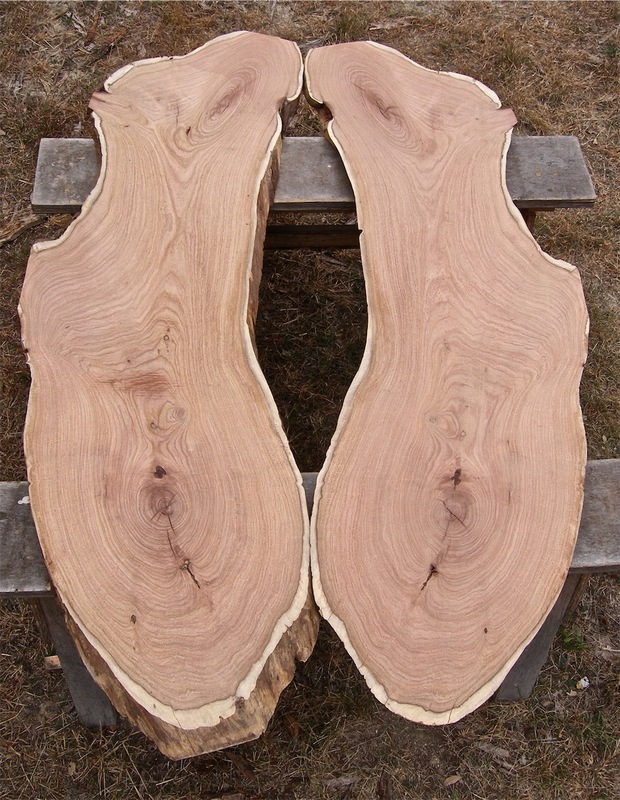 I would like to make a table of tree slabs myself one day. This blog really inspired me. Hello Qu1nten. Thanks for commenting on my blog. I hope you will try building some natural edge furniture. Also try working in other styles. One way to get better as a craftsman is to learn new styles and techniques. I hope you are enjoying your studies. My name is Bram Göbel. I am studying furniture maker in Rotterdam in the Netherlands. I really like your work. I love the slabs milled pieces you work with. It’s so nice to see the actual tree reflected in the wood. For myself, I would also like to use this in my furniture. It’s a pity the prices of the slabs milled are so expensive. I can only work with them if my client will pay for it. It’s a shame that wood is so expensive, because else I can make a lot more beautiful things. Maybe it’s better like this, because now it’s more exclusive what we make. For the future I wish you the best and I hope we can make more beautiful work like your showing us at your blog. Hi Bram. I agree with you that the price of good material is expensive, especially nice live edge slabs. I suggest developing your skills with less expensive woods. I used pine for many of my early pieces. Later, when you get good clients, you can charge enough to work with more expensive woods. Just keep trying to get a little better each day you work in the shop. All the best! My name is Berend, I live in the Netherlands, and I’m still learning to become a furniture maker. It’s a very nice coffee table, its unique, stylish and there’s a story behind the design. how the design comes forward in the interior. anyway the owners must be very proud of this piece of art. Just like many of the other commenters on your blog I’m studying to become a furnituremaker in The Netherlands. I too got the assignment to comment on a collection of blogs, so here are my thoughts on your table. First of all, i like the way you used both life edge wood and the mirroring technigue in the same piece of furniture. To be able to have life edge wood and the possibility to mirror that wood is truly outstanding. What I also like is that you didn’t go with a simple base for this table. It would be stylish, but it’d be less of a challenge and way less unique. Even though it’s not really my style of furniture, I absolutely love the craftsmanship behind this. Sorry for the delay in responding to your comment. Thank you for your insightful comments about my table. I am happy you were able to notice the details & craftsmanship that went into this piece. I wish you all the best in your furnituremaking endeavors. My name is Tim van Alphen and I am also a student from the HMC in The Netherlands. I really like your blog on how you made the coffee table to see how you worked the wood and the different techniques you used to put together all the parts. I also love the raw design of the tabletop, it makes it look way more natural than a straight one. I really like the shapes and roundings you used in the design, it makes the table look very smooth and comfortable. The wood you are using also looks realy nice ! I am sorry it took me several days to respond to your comment. I have been busy finishing up a project for a customer. I am so glad you like my table & I thank you very much for your comments. I wish you great success in your studies at the HMC! My name is Danielle de Ruijter and I am also a student at the HMC in Rotterdam. Our teacher gave us the assignment to comment on your blog and I enjoyed reading your blog. I really like your design and the table is beautiful. Thank you very much for taking the time to read my blog and comment on my work. I hope you are enjoying your studies in furniture making. Best regards. My name is Tim van Alphen I am 19 years old and like the others I am also an student at the HMC at Rotterdam the Netherlands. I enjoyed reading your blog and looking at the pictures. I really like the natural style by keeping the original natural shape of the wood especially the table top! I really like to make a table in this style to sometime! I also love the types of wood you used in the table, could you maybe give me the name on the darker wood you used on the sides of the table? Keep up toe beautiful work ! My name is Perry van Dam, just like the others i am a 3rd year woodworking student from the HMC Rotterdam to. That coffe table is realy awsome, i like the hardwood organical shap of it. It realy brings nature in their home that for sure. personally i would go for hardwood base instead of metal. But of course you have to listen to the client. I am Brian Otte and I am also a student of the HMC in Rotterdam. I have also read your blog for my English homework. I really like the live edge style a lot. I hope I can make this kind of furniture one day! My name is Mik Witlox and I’m a student at HMC from the Netherlands. How you mirror the wood it is very nice. I enjoyed your post very much. The way you describe these projects from beginning to the end is very useful. Now I think you’re quite familiar with the drill right now. I’m also a student at HMC in Rotterdam. And I was also assigned to write something after having read your blog. I am a 22 year old guy that is studying to be a furniture maker. I loved reading your blog! Although I have to say that I liked watching it even more. I really like the fact that you are such a good craftsman. And I share your opinion regarding the design of the table. I also think dat it is better to design an entire table and not just the top. The legs matter too. And looking at your table you succeeded very well in making a table that not only has a very nice top but also a very beautiful and crafty base. My name is Waylon van Vugt, I’m an aspiring furniture builder from the Netherlands. I Always enjoyed looking at, and designing furniture that looks like it comes straight out of nature (if that makes sense), I frequently reach out to other designers that make furniture like yourself, as I am really interested in building these pieces myself. Just to give my own opinion on the Simple base-Intricate base discussion. As much as I love to see all-round design on a piece, I do side with the minimalistic base on this one, I find myself staring at live-wood table tops for hours, every time enjoying small details in the wood. If the table were to have an intricate base, i would find that more distracting, than an addition. Nonetheless, great stuff! I will be keeping my eye on your builds.